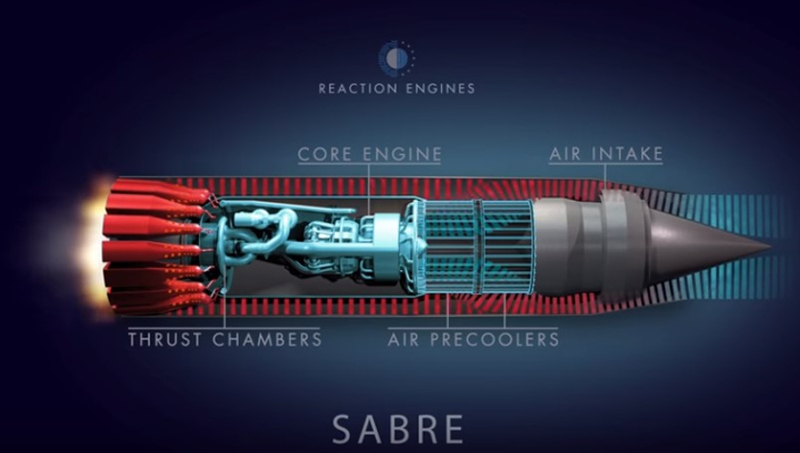 The development of the SABRE air-breathing rocket engine has passed a significant milestone, an advance that puts its UK developers on course to revolutionise high-speed flight. Reaction Engines’ precooler heat exchanger passed all test objectives in the first phase of high-temperature testing designed to directly replicate supersonic flight conditions. The precooler is a key element of Reaction Engines’ SABRE (Synergetic Air-Breathing Rocket Engine) hydrogen-fuelled engine, which uses atmospheric oxygen in its combustion cycle, switching to an onboard supply of liquid oxygen once out of the atmosphere. The precooler ensures that the engine core runs with cold inputs and keeps the core components cool despite the heating effect of its high velocity. The ground-based tests saw the precooler quench the 420°C intake airflow in less than 1/20th of a second. The intake temperature replicates thermal conditions corresponding to Mach 3.3 flight, which matches the speed record of the SR-71 Blackbird aircraft, the world’s fastest jet-engine powered aircraft. Reaction Engines said the tests are the first phase in a test programme that will see the precooler test article (HTX) exposed to high-temperature airflow conditions in excess of the 1,000°C expected during Mach 5 hypersonic flight. The testing milestone took place at Reaction Engines’ TF2 test facility located at the Colorado Air and Space Port, US. The TF2 test facility has been constructed by Reaction Engines to undertake ground-based ‘hot’ testing of its precooler technology. The technology has already passed tests in the UK where its performance was validated at ambient air temperatures. 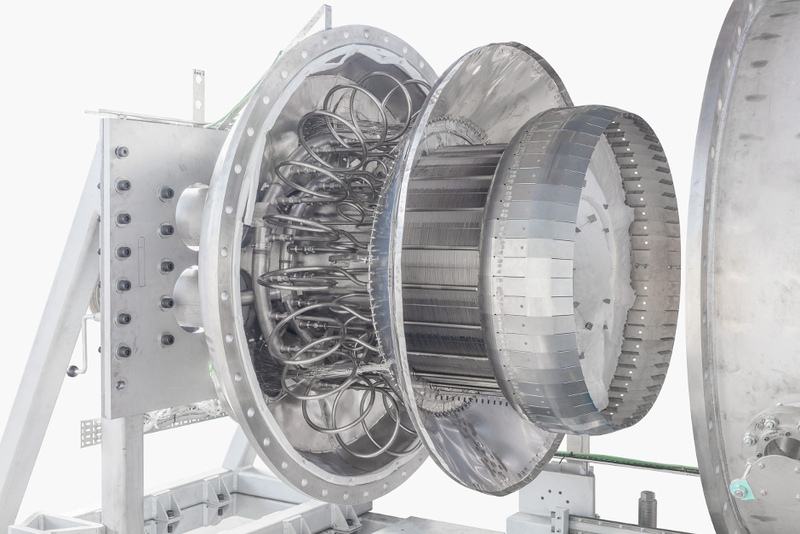 To replicate the conditions the precooler will experience at hypersonic speeds, the TF2 test facility uses a General Electric J79 turbojet engine formerly used in a McDonnell Douglas F-4 Phantom aircraft to provide high-temperature airflow. Engineers at Reaction Engines’ Culham headquarters constructed the HTX precooler test article and after initial testing it was shipped to Colorado at the end of 2018, with ‘hot’ testing commencing in early March 2019. In addition to the hot precooler tests being conducted in the US, Reaction Engines is in the final stage of constructing its TF1 test facility at Westcott, Buckinghamshire, where it will undertake ground-based testing of a SABRE engine core. According to the BBC report on this, the cooler was working at a rate of about 1.5 MW, using ‘chilled Helium’ as a coolant. This begs the question as to how the Helium is to be cooled in continuous flight ? What happens to the heat that is taken from the incoming air stream? And what happens in the event of a catastrophic cooler/coolant failure when in use? I am reminded of the mechanism/system that I believe was used at one point during initial trials to accelerate the air-flow into the Olympus engine(s) for Concorde: then there was no concern about its temperature but its speed. Somewhere on the outskirts of Paris (very secret) was a facility which for a nano-second could ‘gather’ the entire power of the French ‘Grid’ and use it to accelerate the airflow towards the entry elements of the engine. What was essential was that it would switch BACK without fail! Otherwise France might be switched off! as a very young undergraduate and inexperienced vacation student at Bristol Siddeley I recall hush-hush discussions about this. Does anyone else recall? if one is seeking massive surface area for any purpose, how about the activated carbon within NBC [you know WMD that we went to war about 20 years ago] protective suits (one suit worn by one soldier has the equivalent of the surface area of Wembley Stadium!) though not sure how it could be persuaded to reduce temperature? Pretty sure that the helium is in the primary circuit already. The bit that does the cooling is cryogenic hydrogen which is then thrown outta the back as reaction mass. I applause these imaginative engineers who find solutions to difficult problems. Skylon started life as the British Aerospace / RR Hotel spaceplane: this was effectively binned by renowned genius Ken Clarke. They’ve been working on the heat exchanger tech for 30 years. The helium is then cooled by liquid hydrogen from the main tank, prior to it being burnt in the engine. Now might be a good time to support this company, I’ve never bought shares as I don’t much care for the ‘buy / sell just to make a quick buck’ that doesn’t really help emerging Industries. So, where can I buy some. What happened to all the comments on this topic. I didn’t bother reading the article because I first read about everything about ten years ago. I was just reading everything on the Reaction Engines site. Back then they were saying that the fully working prototype would be ready by 2020ish.Not just an engine but a space plane double the size of the A380. Slow doesn’t begin to describe the pace of this project. Reaction Engines have had to fight for every scrap of funding. HM Gov. is not really serious obviously. It’s not a listed company, so it’s likely the only hope you have of buying shares is to be a major investor. Nor do I participate in a horse-race in which only the jockeys (CEOs) move, and they only from side to side? As far as I can tell, my financial adviser makes more in commission than any ‘gain’ he creates for me (whatever that is) from using my money to make his! Those who insure my house are also involved in yet another house race: but one you hope you come 2nd! (ie don’t have to make a claim) the retail consortium for the most part sells ‘stuff’ they neither own, made or grew: and the Banks . ..? Enough said already. Your world and welcome to it? I am very pleased to see that they have got their pre-cooler to work. It is a great tribute to their manufacturing team too – that they have managed to make their microchannel devices (i.e. those with channel width less than 1mm) with high integrity – and, I hope, good yield. Using a gaseous coolant in a closed circuit should eliminate channel clogging. Compare this progress on SABRE, the work done on Skylon, with the work being done on Stratolaunch (the largest all composite aircraft ever done), and I can see the large twin-boom being used for initial lifting duty, the the Skylon could (perhaps) be launched in flight from this platform, and the SABRE kicked in to bring her up to sub-orbital flight, where on-board oxidant has to be utilized to reach orbit or further.